If you are joining us from ohdeedoh - a warm welcome! It is very nice to meet you!! Wooohooo!!! Great feature! And such a fun project. Congrats! 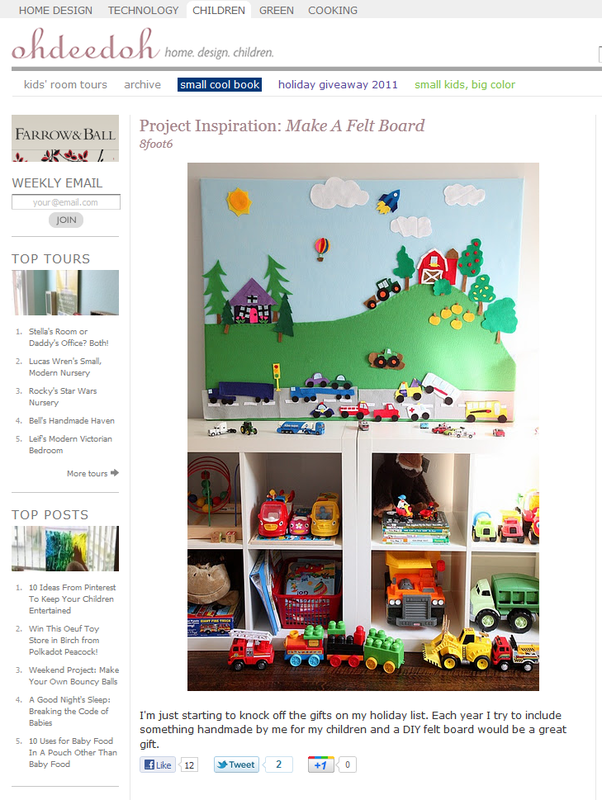 I just found your blog through a link to your feltboard on pinterest. Love the content on your blog! I can't stop looking at your felt board! I'm going to follow your instructions and try to make one for my soon-to-be 2-yr-old... Love love love it. Thanks erin! it was so fun to make! Hi Shannon! I just clicked on your name on a comment at SF Girl By Bay and found your lively blog. Then I was reading through and saw this post, with my daughter Stella's room tour on the top left of the screen post (looks like we were on Ohdeedoh together in November). And THEN I saw you had a VBAC...hooray! I also had one, but haven't written about it yet. And we are both mothers of two....I started hoping you lived here in SF! So many little things in common! I'm glad I found your blog, and will be poking around some more. Your place looks so nice. We have just started house hunting (for a fixer-upper, I'm an architect and know all about the difficulties in digging down, btw!) so I am looking forward to reading more about your experiences! Happy New Year!